Since the weather has gotten cold I’ve pretty much given up on my remaining outdoor vegetables. The tomato vines have wilted, I pulled out the runner beans, and the last few zucchini are melting into the ground. The tomatillo plants continued to fruit despite everything, although I was feeling a bit burned out on actually eating them. I decided to pick all the remaining fruits a few weeks ago and keep them in a bowl on the counter, just for decor. 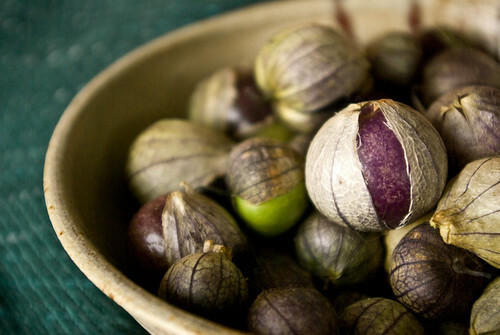 I adore the texture of these tomatillos, and the mix of jewel tones as some turn purple and others remain brilliant green. Yesterday I finally threw them into the compost, but took one last picture in the soft afternoon light. I had just finished weaving a teal wool scarf for the upcoming Rexville art show, so I used that as a color backdrop for the tomatillos. I like the resulting contrast. i do like the color of the scarf! it’s really lovely.